The Steamboat Grand has the professional planning staff and flexible space for all of your group, conference, wedding, or special event needs. We can host as many as 600 guests or as few as 20 without losing the sense of intimacy. All you have to do is let us know the size of your group and the nature of your meeting and our team will tailor the space to fit your needs. The Steamboat Grand offers more than 17,000 sq. feet of flexible indoor meeting, banquet and pre-function space conveniently located on one floor of the hotel. The 5,484 sq. ft. ballroom can be divided into three sections and features modern electronics designed to accommodate high-tech meetings, events, concerts and teleconferences. Four additional meeting rooms are ideal for smaller group meetings and breakout sessions and have over 4,800 sq. ft. of combined space. The hotel also offers an additional 10,000 sq. ft. of outdoor function space that is perfect for weddings and other social events. Whether it’s the wedding of your dreams, a cozy and intimate ceremony, or rehearsal dinner, the Steamboat Grand hotel is the perfect place for your special wedding event. We can host as many as 850 guests or as few as 25. 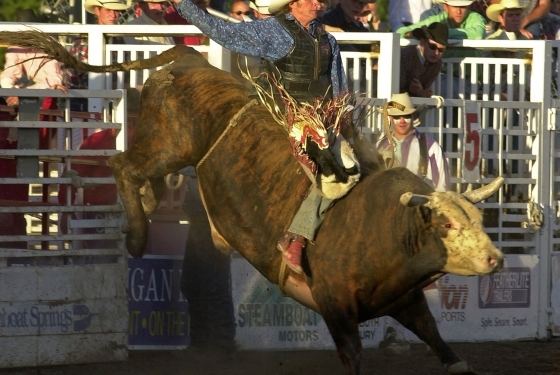 Choose an outdoor affair in the splendor of the Rocky Mountains or an indoor function in an elegant banquet facility, featuring a uniquely western designed 5,500 sq. ft. main ballroom that accommodates up to 350 seated at tables. Capacity Priest Creek Ballroom 5,484 sq. ft. 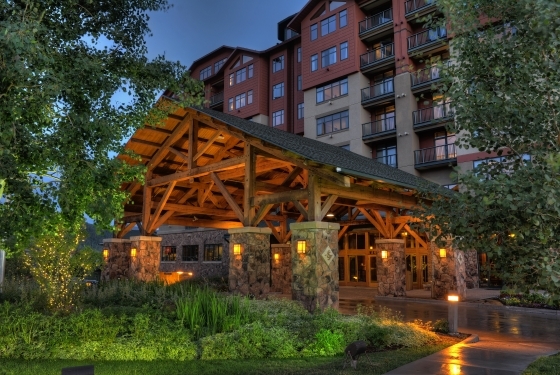 Located at the base of the Steamboat Ski Resort, The Steamboat Grand features 328 beautifully appointed guestroom accommodations, offering a variety of hotel rooms, one-, two- & three-bedroom condominiums and eight luxurious penthouses. 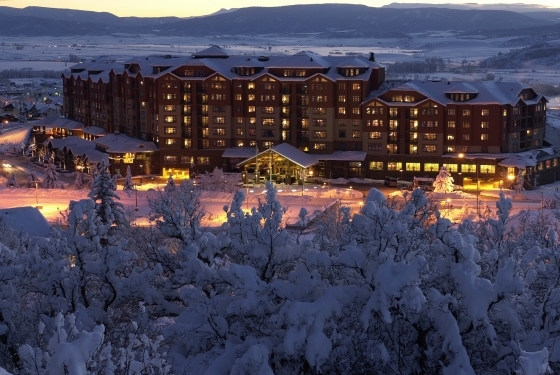 The Steamboat Grand brings a new level of hotel service to one of America’s favorite year-round ski resorts. Surround yourself in casual elegance and enjoy all of the amenities that the Grand has to offer! All rooms are appointed with top of the line furniture and appliances. Hardwood custom cabinetry and polished granite counter tops are in all kitchens and bathrooms. All rooms have 32” flat screen TV’s and DVD players, complimentary wireless internet, humidifier, in-room safe, coffee makers, hair dryers, robes, ironing boards and irons. 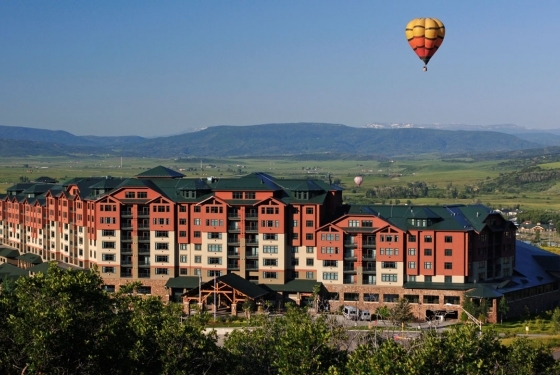 Your view is either a gorgeous mountain vista or the beautiful Yampa Valley. The cozy Steamboat Grand Studio room comes with a Queen size platform bed, a full size sofa sleeper, kitchenette including full size stove, oven, dishwasher, microwave, and a 3/4 size refrigerator, dining nook and a standard full bath. Approximately 300 square feet. Maximum occupancy is 4. A separate bedroom with either a King or Queen sized bed adjoins to a fully-equipped kitchen, dining area, and living area with a queen size sofa sleeper, gas fireplace and one standard bath. Approximately 750-975 square feet. Maximum occupancy is 6. The Grand King condominium is our deluxe one bedroom condominium with two full bathrooms – featuring a separate bedroom with a King sized bed, balcony & fireplace and a master bath with Jacuzzi tub for two. This superb bedroom adjoins to a fully-equipped kitchen, dining area, and living area with a queen size sofa sleeper, gas fireplace and standard bathroom. Approximately 975 square feet. Maximum occupancy is 6. Two separate bedrooms with either a King or Queen sized bed in each bedroom adjoins to a fully equipped kitchen, dining area, and living area with a queen size sofa sleeper and gas fireplace. This unit features two standard bathrooms. Approximately 1100-1300 square feet. Maximum occupancy is 8. Our Two-Bedroom Deluxe condominium is our premium two Bedroom accommodation with three full bathrooms. The master suite features a separate bedroom with a King sized bed, balcony and fireplace and a master bath with a jacuzzi tub for two. Bedroom number two features two Queen sized beds and a standard bath. Both bedrooms adjoin to a fully-equipped kitchen, dining area, and living area with a queen size sofa sleeper, gas fireplace with a standard bathroom. Approximately 1350-1500 square feet. Maximum occupancy is 10. The Steamboat Grand has eight private residences located on the 7th floor. All penthouses feature exquisite 7th floor views, private 7th floor elevator access, gas fireplaces, tumbled slate accents, granite countertops and vanities, Berber carpeting, slate and hardwood floors, elegant mountain furnishings, spacious galley kitchens, formal dining areas, walk-in closets, whirlpool tubs, and washers and dryers. Three, four and five Bedroom Penthouses are available. 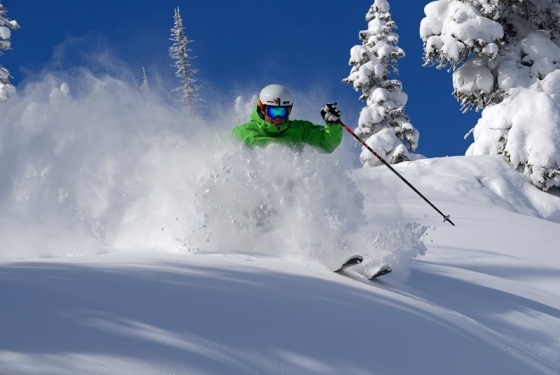 With the vivid colors of summer flowers to aspen in full fall glory to the pristine freshly fallen Champagne Powder® snow of winter, Steamboat make ‘once in a lifetime’ events spectacular and fairy tale weddings come true year-round. Leave all the details to Steamboat’s dedicated team of professionals to set the stage on this special day for a celebration you and your guests will remember forever. It’s your special day. A day that will last a lifetime. Make it just the way you dreamed of with Steamboat. 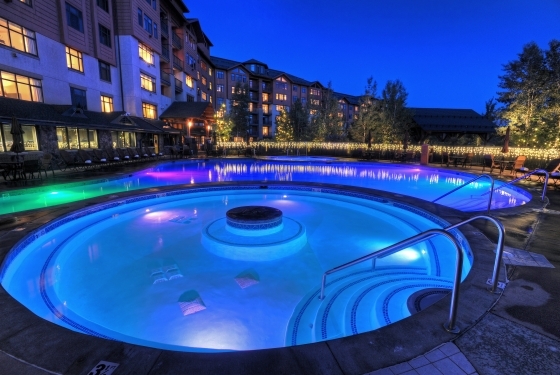 The world-class Steamboat Grand Hotel brings a dedicated level of service to one of America’s favorite year-round resorts, offering world-class ambiance with genuine friendly service, reminiscent of the grand lodge spirit of the West. 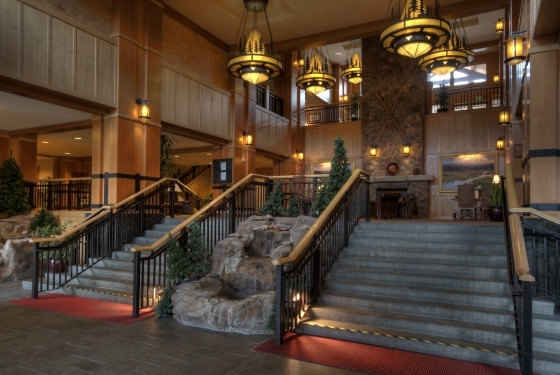 With 327 guest rooms and 17,000 square feet of indoor and outdoor meeting space, The Steamboat Grand provides more than luxurious space, it provides flexibility, hosting as many as 850 guests without losing the sense of intimacy and all in the splendor of the Rocky Mountains. Treat your guests to a ride up the scenic Gondola with a beautiful mountaintop ceremony on the Thunderhead Sundeck or mountain retreat of Four Point Lodge or on the grand front manicured lawn matched with a reception inside the adjacent mountaintop lodge. Catering services are available for groups of any size providing a variety of appetizers, salads, dinner entrees, desserts and beverages. 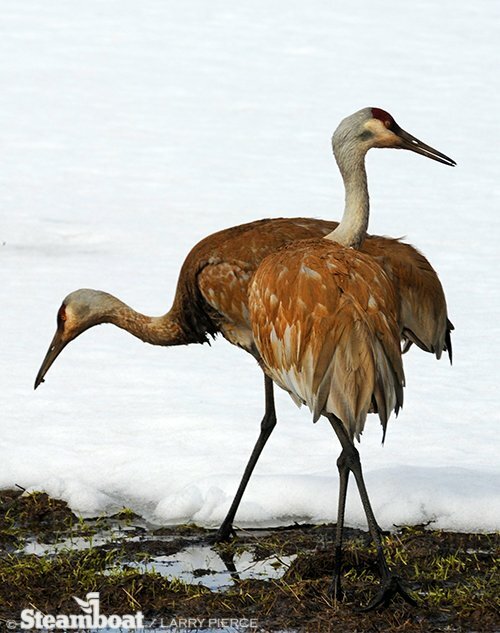 Sandhill Crane sightings around the Yampa Valley.